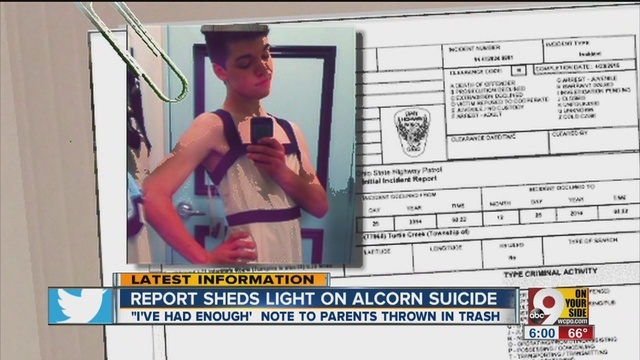 The Ohio Highway Patrol released it's report on the tragic suicide last winter of transgender teenager Leelah Alcorn. I have written several times here in Cyrsti's Condo about how her death is constantly reinforced with me because I travel that stretch of road continually. The report really didn't surprise me much. The OHP reported Leelah Alcorn, the 17-year-old transgender youth who committed suicide last December, had been frequenting suicide prevention websites in the weeks leading up to her death. The report also explains that Alcorn's mother had found a note on Alcorn's bed shortly after police notified them about her death. The note read "I've had enough." The Journal-News also reported Alcorn had been undergoing conversion therapy against her will when she died, a type of psychiatric treatment aimed at changing the sexual orientation of gender identity of gay, lesbian, and transgender youth that President Barack Obama condemned earlier this month. In addition to Leelah's story, it is important to note here in Southwestern Ohio, we are on the LGBT "fault line." An example is Cincinnati which has (and is) working hard to create a diverse environment but then again you don't have to travel far to find a very active religious community who I am sure still believe salvation will rid any poor transgender or gay kid's problems. And how about Leelah's parents? Are they still "true believers" more than true "under-standers?" I can't imagine their pain-or thought patterns. Especially now in the highly publicized transgender era. Sacrificing your child "for the cause" may be a bit much-for anyone. Including the "snake worshipers."